With the advent of eBook reading applications for both Android and iOS, the average book reader is spoilt for choice. There are thousands to choose from. Some are going with the plain jane kind of layout, focusing only on the textual things, like FB Reader. However, some applications try to load in all the features of an eBook in them, and in turn become large. Best example Helicon, Foxit, Kindle and many. There are only a few applications which maintain a fine balance between being effective as well as feature rich. The application we are talking about today belongs to this group. We are referring to Cool Reader here, and we will have to say that it justifies its name by being pretty Cool to use. Let’s find out more about it. What makes Cool reader stand out is the ease with which you can read in it. The more you read in this application, the more you’ll be apprehensive about reading anywhere else. And the best part is it supports all the known formats in the world. All this in a small, simple package means that you won’t need any other reading app for your mobile. Yes, the app also has some Cool features which make the reading all the more enjoyable. Multi-language support, multi-panel support, scroll and page turn animations, and of course more. Imagine this; you get all the features you want from Kindle within this lightweight application. Of course, the app is not without its limitations which usually revolve around the operability and compatibility. Thus, it becomes important to study the description of Cool Reader which is rising above the horde of other apps. Operations within Cool Reader – What works? 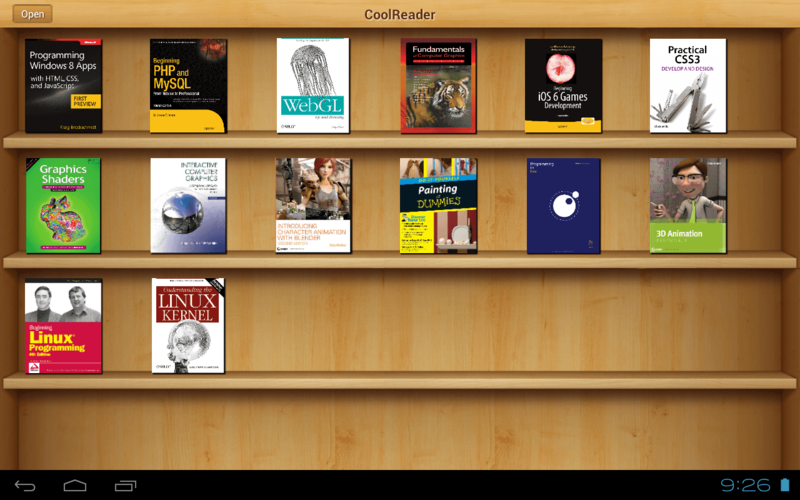 Cool Reader is an open source eBook reader, XML/CSS-based, which runs on Windows, Linux and Android devices. Opening files can be a little awkward, because the program doesn’t use native Windows dialogues, or accept drag and drops – you must grind your way through its built-in file browser, instead. This is because the app has been built for Linux users, as it offers a better control of file management and offers a decent amount of inbuilt security. Cool Reader comes with a small size, but as it improves on the cache, we can see that the App size on the disk becomes rather big. So, it is necessary to use the file explorer that comes with the eBook application. Locate your file, and the situation improves. The book is automatically sized to fit the window; there’s a nice animated page-turning effect as you move through it; a separate table of contents and bookmark system make navigation easy. Obviously, the initial things which might confuse you, become pretty easy if you are patient with the app initially. Once that is done, you will see that the app is super smooth to use. Designed by Vadim Lopatin, the app has secured a 4.5 out of 5 ratings and near to fifty million installations on the Play Store. The app unveils numerous unmatched features on the Android platform to experience a pleasant reading on the screen. Cool Reader app is a free download from the Google Play Store. However, there are in-app purchases to deliver privilege features whose cost ranges from $0.99 to $79.99. The main objective of Cool Reader Android app is to let a user read and access different formats of eBooks. The app provides a simple interface. As we mentioned earlier, Cool Reader comes to the fore with a minimalistic idea about reading books. The user comes to experience simple reading ease, with a clear thought for eBook formats. The idea is to provide a clear, concise, hassle-free reading experience on the screen. Now, of course, just bare minimum works for the most part, but reading ease is sometimes within simple tweaks around. To truly enjoy your eBook reading, the app comes with its in-built scrolling, text search, hyphenation dictionaries, brightness adjustment and more. Cool Reader supports nearly all eBooks formats such as ePub (non-DRM), fb2, doc, txt, RTF, HTML, TCR, PDB, PRC, Mobi (non-DRM), XML formats. Additionally, its ability to enhance FB2 format support (styles, tables, footnotes) is remarkable. Also, It provides support for Chinese, Japanese and Korean languages and holds an incredible auto detection feature of TXT file encoding. And as the review forays into the technical details of Cool Reader, we would like you to remember a thing we spoke about earlier. 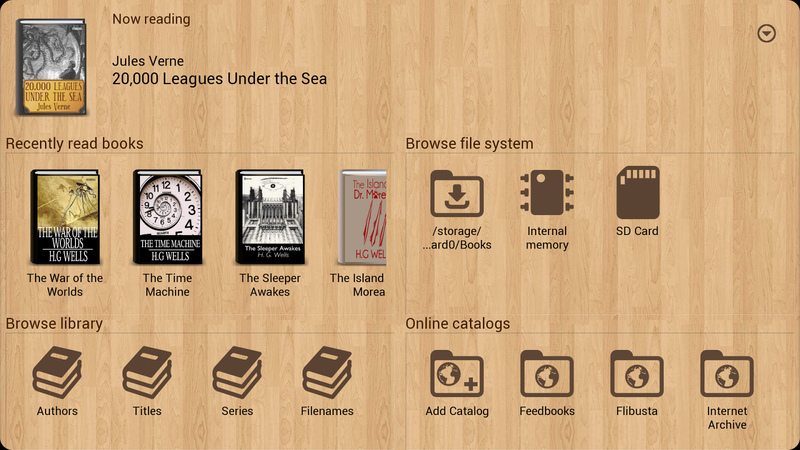 We said that this app is a Kindle alternative, with half its size and system sapping abilities. We have to see that as a major advantage in recent times, as we see presently that many apps do exactly the opposite. They are of large size, and upon them, the system hangs up. This becomes a great problem for users who like to multitask within their systems. And for lower processor speeds, you can safely say that apps like Kindle always take ages to open. Now, with everything said and done, the best reason why you’d want this app in your mobile, is because of its lower system configuration. But that is not all to it, the Cool Reader is known for many other things too. The simple and elegant input tools and control tools are some of them. Prima Facie, the traditional page turning or sliding page animation is the best feature it delivers on the board against its rivals. It provides support to LitRe’s online bookstore, text to speech, hyphenation dictionaries, online catalogue and much more which are not available with free applications. It lets a user day and night profile to adjust the colour and brightness on the screen for a healthy reading and permits to add comments or sticky notes in the file. 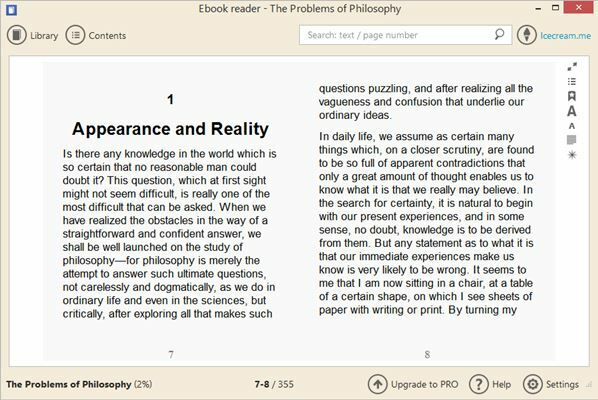 The other spectacular features of Cool Reader app include reading books directly from the zip archives, automatic reformatting of the .txt files, support for more than 50 background textures and incorporating additional textures on the page backgrounds. The app has integration with multiple eBooks website to let a user narrow down the search of the desired book. Thus you are always in the know of the book at your fingertips. Yes, you have this feature in many other ebook readers, but they aren’t that easy to operate as the Cool Reader. The cool reader comes out with an innovation which brings reading to a whole new level. When you usually understand eBook reader, you have the idea to download, install and operate the application. However, in PC system, Cool Reader provides you with an effective option, of not installing the app at all. With Portable options with the Cool Reader, you can use it within any flash drives and make your eBook reading all the easier and effective. You see, you can run the executable file on the flash drive, to pop up a window, which allows you to load up books and materials. The best thing about it is that you don’t have to follow up on the registry values. Nothing is left over when you unplug the device. Thus, you can make it for quick and easy reads, without the need to install and worry about it. Having said that, one will understand that you cannot operate with the advanced features of the eBook reader app, without installing it. This is what perhaps makes the Android and iOS version all the more exciting. You don’t have to worry about anymore, conversion, sharing, editing and exporting the eBook materials. With internal codecs which come with the app, Cool Reader becomes your all in one solution for all things eBooks. Of course, you have these options, in which the perfect reading can be advanced. When we look at the way we read, most of the eBook reading apps, Kindle, ePub rendering apps, Kobo, and more, give you Night Read modes. That’s kind of like the norm in today’s world. When you pick up the reading apps within Play Store, most of these support Night read options, which allow you to relax your eyes while reading the eBooks. Cool Reader also supports the same and brings a certain ease to reading. The different uses of Text to Speech are always within the user preferences. With Text to Speech and that too which works effectively in this app, you can save really good time in bringing content alive. Cool Reader is exceptionally configurable, too: you’re able to tweak fonts, colours, text formatting, page layout, controls and more. The package also includes tools to help you browse online eBook catalogues, including Project Gutenberg and the Internet Archive, but these had some problems. We were able to view details of books, but not download or view them. That becomes a slight issue when you want an unhindered view of things, and want to just keep on reading. Cool Reader sets and stores a separate profile for each mode, and will automatically switch between those profiles when you activate either mode. One other thing which is highly useful for power users, who want from less, is the wide range of customization options. When you look at it, Cool Reader under its minimal hood hides many useful profile settings which can be tweaked and tested for a different genre of books. That makes this app, more useful than the usual Kindle, Nook or Kobo which are world leaders in eBook readers. When you do, twist these things, you get more for the value for Cool Reader. When you also experiment with different layouts, additionally, CR has several custom backgrounds built in, such as a ‘sand’ texture, a few different ‘paper’ textures. Of course an option to have the background be a solid colour of your choice. Also, the program uses a standard colour mixer so you can pick from literally thousands of colours and hues and shades for backgrounds and for fonts. As if that wasn’t enough, it also allows you to use your own customised backgrounds, in the form of picture files, like jpg or bmp’s. You are set to read your books in the way you like them to, with customizations available for Fonts as well. That’s the speciality of Cool Reader. It allows you to bring your choices and preferences to the fore when you load up the app. It also allows you to store each of these options within the night or day profiles so you could have a day profile that has a 12pt font of bright green letters, and you could have a night profile with a 20pt font of dark orange letters. You can use any combination of colour and font and size and store it in whichever profile you like. Thus, with a flick of a button, you load up any profile and font, instantly basing on the need. Thus, Cool Reader makes for an excellent reading companion for all your eBook needs. Check it out on your Android, iOS or Windows platform right now.